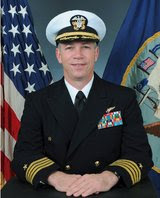 Navy Capt. Owen P. Honors, removed from command of one of the Navy‘s most powerful warships and under investigation for ribald videos made to amuse his crew, is getting moral support from an unexpected quarter — gay sailors who served under his command. Interviews with sailors on the Enterprise at the time, including several who have since left the Navy and say they were openly gay when they served, suggest that the videos, far from offending, did, as intended, raise morale through their crude humor. Many of Capt. Honors‘ former shipmates think the Navy has already gone too far in stripping him of his command. Capt. Honors “absolutely did not” create a hostile or homophobic atmosphere on board, added Eric M. Prenger, a gay sailor who also served on the Enterprise at the time. Mr. Prenger, an electronics technician, third class, said the crew looked forward to the videos, which were broadcast on the ship’s closed circuit TV system every Saturday night, preceding the showing of a movie. We're quite surprised to see The Washington Times acknowledging non-heterosexual sailors serving openly in our military. In any event, we acknowledge the significant challenges faced by military leaders in maintaining morale in a dignified and respectful manner.